Steve is a graduate of NAIT (Northern Alberta Denturist Program). He is committed to his continuing professional education and advances in the Denture and Dental implant supported prosthetics. Our Denturist specializes in caring for adult patients who want a higher level of care, have high expectations and have the desire to improve the appearance of their smile. The cost of your dentures will depend on the quality of materials used in manufacturing them. In order to provide you with the best possible service and cost we offer many different options for you to choose from. All options and costs will be discussed with you before any treatment commences. Your Denturist will explain which options may be best suited for your situation. If you have dental insurance please provide us with all the information so we may explain your benefit coverage, and receive any pre-authorizations that may be required before your denture construction commences. Records of all procedures will be kept on personal, confidential file, so we will be able to take care of your future dental needs. Other health care professionals may be made aware of your denture treatment, so that a more coordinated approach can be taken to enhance your oral health care. If you have any further questions or concerns about your denture care, please do not hesitate to ask. Your Denturist will be happy to show you the facility to better acquaint you with the work that goes into the construction of your dentures. 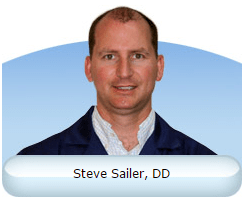 If you would like to have a consultation with Mr. Sailer, contact us today!